Stephen Grove will expand his endurance racing knowledge this weekend (11-13 January) when he competes in the famous 24 Hours of Dubai at the Dubai Autodrome in the United Arab Emirates. The race will serve as another strong tune-up for the Melbourne driver ahead of his Liqui-Moly Bathurst 12 Hour campaign this February 2-4. The 2017 Porsche Carrera Cup Australia class champion will drive for German squad MRS GT-Racing in the 24H Series’ 991 class, sharing the new generation Porsche 991-II Cup with German drivers, Bertram Hornung and Matthias Jeserich. Grove’s time in the new generation Porsche Cup Car at the Dubai event will prove critical as he prepares to tackle a full season of Carrera Cup Australia with a brand-new car of the same model in 2018. This weekend will not be Grove’s first outing in the new car, having finished on the podium in November’s 24H of COTA in Texas with American based team Freem USA and co-drivers Danny Stutterd and Sam Fillmore – also Bathurst 12 Hour contenders. However, the Melbourne-based driver still feels the laps he cuts at Dubai on the weekend will be vital in learning the ropes of the new car. “I’m excited to work with a renowned team who has an excellent pedigree within Porsche Supercup and Carrera Cup Germany,” said Grove. 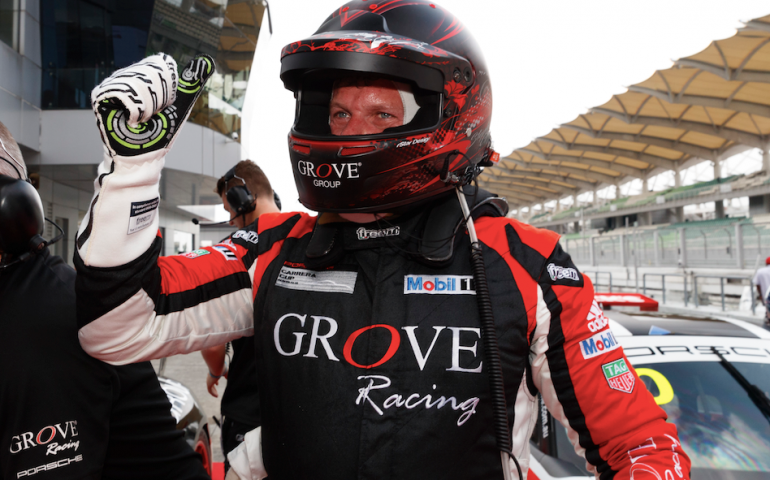 Grove will lap up the world class Dubai Autodrome Grand Prix circuit for the first time in his career and is excited for the fresh challenge. The 5.3km high speed venue consists of 16 turns with two long straights and a number of heavy braking zones, a layout set to test the endurance capabilities of the new generation car. On top of that, the 24H Series features multiple classes and regularly has grid sizes that exceed 90, which will be another new challenge Grove is looking forward to. “The circuit in Dubai looks really exciting, there are a lot of off-camber corners and long sweeping bends so it should be quite fun to race there in amongst the massive grid,” exclaimed Grove. Grove also outlined the importance of the Dubai event as it’s his last race before the Bathurst 12 Hour, with 2018 set to be Grove Racing’s biggest attack on the mountain after the announcement late last year Stephen would be joined by his son Brenton Grove, and Porsche star Ben Barker in the team’s Class B entry. “For me this is another first,” added Grove.